Our professionals can restore your natural stone floors to their original state. Each floor will need a unique approach based on the stone type, wear patterns from foot traffic and possible issues stemming from inaccurate installation and environmental or product damage. Our experts use an array of industry-leading techniques to create restored floors you will be proud of. Using diamond bit disks we remove scratches and wear. Moving from coarse to fine diamond discs we address deeper scratches and then, in stages, bring the floor to a perfectly smooth surface. Polishing with refinishing compounds brings the floor to up a beautiful shine. You can choose a high gloss finish or a semi-gloss finish. If you desire a matt finish, and the stone lends itself to this, we will hone the floor instead of polishing. This process results in your choice of a fully matt finish or one with a desired degree of lustre. Chips can be caused by an object being dropped and cracks from something as simple as the building settling over time. Our artisans use an artist's array of colours combined with special epoxy compounds to repair types of natural stone. With this specialized technique we can seamlessly repair almost all types of natural stone. Stains on stone are often caused by rust, water or oil-based compounds. A special poultice is applied to lift the stain out of the stone. Once the stains are removed an impregnating sealer is applied to protect the floor from future staining. If stone tiles have been improperly installed the height between tiles can differ. The "lip" is the difference in height from one tile to the next. 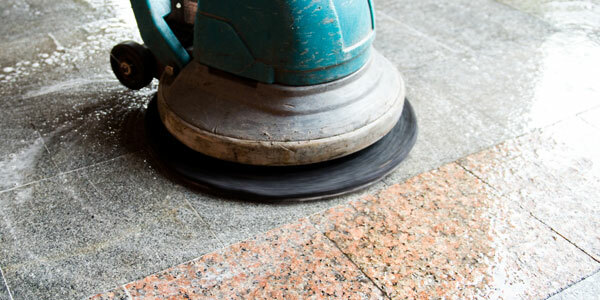 Lippage removal is a deep grinding that brings the entire floor to an even surface. The approach to grout renewal depends on the level of damage to the original grout. Deep cleaning can remove built-up dirt and restore its appearance. If the staining is more severe we recommend applying a coating over the original grout that is tinted to the colour you choose. If grout is badly damaged or lifting, removal and application of new grout is required to ensure the life of your floor. Concrete has become a contemporary no-wax floor of choice for many. With polishing, concrete gains a glass-like sheen and is very durable and easy to maintain. We have the products and expertise to make your concrete floor gleam. Sealing dramatically increased the lifespan of natural stone surfaces. Our professionals meticulously clean and prepare the surfaces and then apply a deep impregnating sealer. We use only the most environmentally conscious sealing products to protect our environment and the health of the people who enjoy the floors. Colour enhancing impregnators can be used on certain stone types such as granite and slate. These products protect the surface and enhance the richness of the stone.